The Lewis and Clark Expedition, westward bound, passed here in August 1805. The old mining camp of Bannack is on Grasshopper Creek about twenty miles west of here. 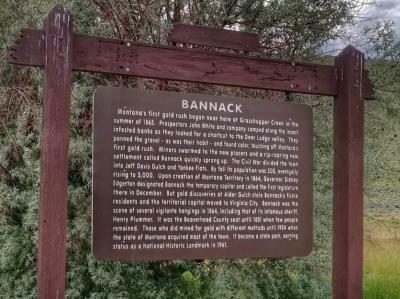 The first paying placer discovery in Montana was made in that vicinity by John White, July 28, 1862, and Bannack became the first capital of Montana Territory. They should have built it on wheels. The following spring six prospectors discovered Alder Gulch and practically the entire population of Bannack stampeded to the new diggings where the new camp of Virginia City eventually became the capital until it was changed to Helena. Henry Plummer, sheriff and secret chief of the road agents, was hanged at Bannack in 1864 by the Vigilantes. It tamed him down considerably.